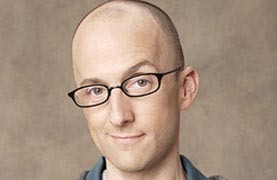 Community is in it’s second season and Jim Rash, who plays ‘Dean Pelton’, has seen his screen time grow since his first appearance on the show. When he first auditioned for the part, he had no idea that his character would become such a popular addition to the cast. 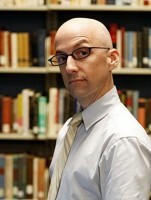 He’s become so popular, that this season the writers have fashoined the show’s web series around him; Dean Pelton’s Office Hours. Not only is Jim an actor, he’s also a writer who’s screenplay, The Descendants (starring George Clooney), has just finished shooting. I spoke with Jim in a recent conference call about the show, webisodes, his side career as a screenwriter and working with the cast. 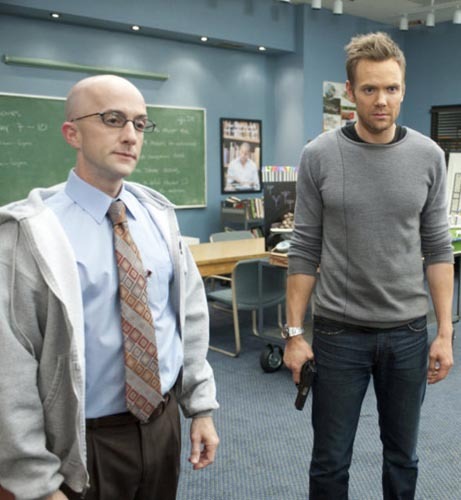 Community airs on NBC, Thursday nights at 8:00 PM/7:00 PM Central. You have great comedic timing. Is it something that’s natural for you, or do you have to work at it? Jim Rash: I wish it was natural. I don’t know. Maybe it comes from you know, just growing up with – being super popular in high school, and you just learn to use it. As far as like training and stuff, I mean it’s honing. Most everything’s sort of got honed I guess – got honed at The Groundlings Theater. I’ve been active at The Groundlings for like 11 years. So, that was probably my training outside of college and stuff. But, I think it was probably instinctual at some point along the way. Do you have any input into the antics of your character? Jim Rash: Yes. One of the sort of fun things that’s been on this ride since the first season is sort of the secrets we’re starting to find out about him from Dalmatian fetishes to his over curiosity of Jeff Winger. I understand down the pike, there should be some more fetishes that might come his way to add to it. And then as far as the Lady Gaga fascination, I don’t know if it was a fascination or just a chance to show off his legs; I don’t know, or my legs. I love the fact that we’re not quite sure what goes on in his personal life, but I look forward to one day having some kind of reveal to that. Whether we want to know it or not, I don’t know. Besides the timing, what did you learn from your experience at The Groundlings that you applied to your work on Community? Jim Rash: Well, I started working at The Groundlings, mainly to take improv classes. And, I think those were beneficial not just with acting, but also in writing because I enjoy doing that as well. And Community, even though the writing staff is incredible and Dan Harmon had such a vision, there is certainly always room for a little improv while we’re shooting. What were your expectations for this character when you were cast? Did you know that the Dean was going to be this crazy? This weird? Jim Rash: No. It’s funny just because I didn’t. When we shot the pilot, I was cast pretty late. I think they had already started shooting. And at the time you know, it was just a guest star on a pilot that you didn’t know whether it would be picked up. They always talk as a possible recurring type thing. And then once the show got picked up, I just had no idea how much they would end up using the Dean. I definitely think it evolved because even in the pilot, it’s sort of funny if you actually look back at the pilot. In the very beginning – I’m wearing a wedding ring in the pilot, and I always said that sort of just disappeared by the second episode that I did. So either he was briefly married or he puts that on – the ring on just for a little bit – for people’s first day of school. I don’t know. But, he’s definitely evolved and it’s been a lot of fun. When you get a new script and you learn these new things about the Dean, do you find yourself saying, “Really? Dalmatian costume? Seriously?” Or, do you rejoice because it’s so silly, or both? I’m always excited when there’s a surprise or something very specific they’ve started to get in their minds, because they start to think of things and lay some groundwork for down the road, which sort of started with that video of the Dalmatians and ended with obviously the finale with Dalmatians in costumes. So, they let it grow. Can you tell us kind of how you got involved in the very beginning in the project? Jim Rash: It was nothing more than I got an audition for it you know through an agent – through my agent. So, it really was like everyone else, just a chance to audition for them. So, it pretty much just worked out. Would you ever consider writing or directing for the show though? Jim Rash: Oh, if they’d have me. Oh. Yes. I would love it. I mean, I would love to certainly write down the road. I definitely on the set watch and try to learn from our various directors we’ve had, just sort of observe. Because it’s just a great opportunity when you’re shooting to sort of educate yourself on that stuff for down the road, for hopes for that kind of thing. How have you found shooting the Webisodes to be different than shooting the actual set with the full cast? Jim Rash: It was the same in the sense of the same set. And actually, it was the most if not all the same crew was shooting that day, because we shot those during a hiatus week. So, that part of it felt the same you know. What got you started into acting and then theater? Jim Rash: Well, two things sort of for me started me towards what I wanted to do. One was I went to a school called Charlotte Latin School, in Charlotte and after I graduated from there, I really wanted to go to Chapel Hill. And, I just — now the world will know — my grades weren’t great. I’ll confess that, and so I really wanted to – I went to a post-graduate year at a boarding school up in New Jersey called the Lawrenceville School. Their theater program there was amazing, and I just sort of fell in love with that, and then carried through to Carolina. And then when I got out to L.A. with The Groundlings. So, it was sort that path I think was it really began, even though I did do some theater in – at Latin. You wrote a movie that’s going to come out soon that stars George Clooney? Jim Rash: Yes. A little guy named George Clooney is in it. Yes, my writing partner (Matt Faxon) and I, along with Alexander Payne, who actually also directed it, adapted this book called The Descendents, so that should come out next year. But yes, that was a great experience. I’ve been writing – that also started with The Groundlings, and had written a couple of pilots and then a screen play as well as adapted one. So, that’s definitely a part of my life I want to continue and nurture outside of Community too. Community is only a 30 minute show, so it’s great that they’re doing these Webisodes because it’s such a huge cast. Do you think the Webisodes will go into the lives of some of the peripherals characters, like Star Burns and Leonard, and even more into your own? Jim Rash: Yes. Well, I hope it will be a little bit of that, because I think one of the things that’s been really fun that Dan and everyone has put together is like even in little small things – I mean, even the larger parts of ancillary characters like, myself and Leonard, and Star Burns, and Rich is coming back. And then also like even little small parts here and there, you always notice the same people resurfacing, because they really wanted to feel like – obviously, like a regular school. I think the Webisodes – at least so far, you know obviously Leonard is in one, and hopefully there’ll be some introductions and crossovers both ways I would hope. But, it’s fun to explore the lives of all the people you see in these classes who might not be the regulars, you know. I wanted to know as an actor in a comedy series, what does it mean for you to be on the same show as Chevy Chase? Jim Rash: It’s pretty great. One of my first episodes back was just with him designing the human being, so it was pretty cool to come back to that, having just done the pilot at that point to have a little story line and one on one time with Chevy Chase. It was a little intimidating that first couple of days but there was no need for that. He was very welcoming, so we had a lot of fun. What’s it like working with the cast of Community? Jim Rash: Oh, it’s great. It’s a really close group. I think that they’ve all bonded and are very welcoming to myself and even any other guest stars and new people along the way. And, it’s fun to watch Joel, who is very quick witted and loves to tease people, and it’s fun to watch him play around with Ken Jeong and then Donald Glover obviously is another one that enjoys that as well. Do you have any plans to maybe write any other kind of stuff? A pilot, a TV show? Jim Rash: Yes. We’re working right now on a pilot for HBO. We had pitched an idea over there, so we are just in the early stages of writing right now. And then, we’re also trying to work on – we had written an original a few years back that had gotten some attention, it was called The Way Back, and we had written it around the time when it was just you know, a lot of things were happening as far as the economy. But in the meantime, I think we’re going to work on this HBO thing, and then you know hopefully, write another original screenplay. So, it’s sort of like a – certainly a side passion that we have, so we just continue to do that. What’s it like working on a show that really seems to go out of its way to value that ensemble? I mean, you have Joel McHale, you have Chevy Chase, and yet so much of the show seems to be about giving the other characters a chance. What’s that like from your perspective, getting that real opportunity to not just support but also really shine in your own right? Jim Rash: Yes. You know, it’s really been great to be on a series that has really embraced all the voices of all the characters you know. It’s like so often, you – and I’ve certainly been on them too. It’s like you know, you have funny stuff to do. You just sort of just pop in and then you pop out and you’re not sometimes integral to the plot. But, the writers of Community specifically have been so great about really embracing the idea of their core cast. It’s like even when all this insanity’s going on, you know Dan and the writers laid in some kind of character growth in it, which is always such a huge challenge, but it’s pretty honorable and that’s what they’re going for. I will say going specifically to your question that yes; it’s just been great that they sort of spread the wealth so to speak, but yet at the same time, keep everyone involved when it is sort of focused on one character you know, which is nice.